This is a perfect bag for going out from the park to the plane,ideal size for everyday use. 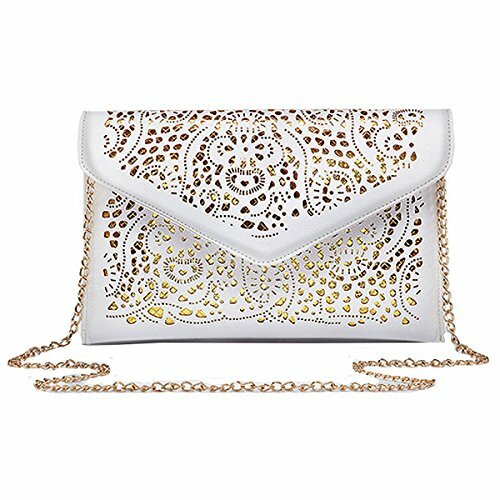 This bag features a vintage hollow out flower design with classic envelop clutch shape,makes you more fashion,elegant and chic. This Chic envelop clutch is the perfect way to express your style in a modern way. 1, Little leather smell is normal. Please put it outside for a few days, the smell will disappear. 2, Due to monitor variations and measurements, the colors and size may appear slightly different. Made of faux Leather,100% Brand New,a zipper pocket inside. This perforated clutch has a beautiful background to accentuate the cut out pattern. With a detachable chain,can be used as a shoulder bag,handbag,clutch. Very suitable to take it with you when shopping,hiking,dating or evening party. If you have any questions about this product by Mily, contact us by completing and submitting the form below. If you are looking for a specif part number, please include it with your message.